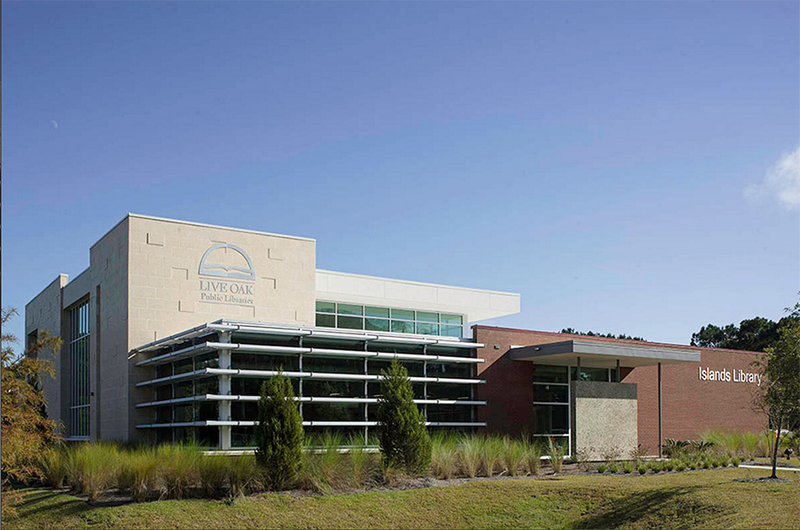 The personnel of Chatham Engineering provided professional mechanical, electrical, plumbing, and fire protection design services for a new public library attempting to achieve LEED Certification. Lighting systems are controlled via the building lighting control panel. This system provides a positive off control for the staff when all personnel leave the building. Large areas are controlled using multiple interconnected occupancy sensors. Specific areas receiving substantial natural light are provided with photo sensors and automatic dimming controls. Small interior spaces are equipped with a single occupancy sensor. The electrical utility company, Georgia Power, delivers energy to the building via a pad mounted transformer. The service voltage is 208Y/120V 3-phase, 4-wire. Power distribution is initially handled in the 1200A switchboard. Branch breakers are provided for the lighting branch panels, mechanical distribution panel. Branch lighting and branch receptacle panels are provided throughout the building as required to provide for the required circuit density for each area. Building is mechanically ventilated to a maximum supplied air flow of 4000 cfm and a minimum of 2500 cfm. Outside air is modulated based on CO2 sensors. The exhaust is a constant 2300 cfm. The building will always be positively pressured. The building is conditioned with a variable air flow rooftop unit with hot gas reheat for dehumidification. The data/communication rooms are conditioned by ductless split system. The rooftop unit supplies air to VAV boxes which distribute air from the ceiling. All heating is electric. Outside air is pretreated with an energy recovery unit mounted on the roof. The plumbing fixtures used were low flow fixtures meeting LEED requirements. Hot water is provided by a 119 gallon electric water heater.